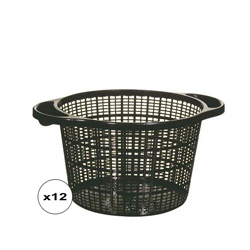 These Baskets are sturdy and durable. They are constructed to allow maximum water flow through root systems of pond plants, while preventing fish from grazing on root systems. 8.3" x 8.3" x 5.1"
9.8" x 9.8" x 6.1"
10" x 10" x 7.5"
18" x 7.25" x 6"
11.8" x 11.8" x 8.1"